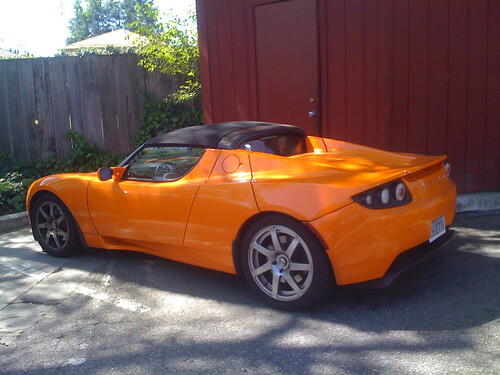 Many are hoping the Tesla partnerships will result in a vehicle more affordable than the $100,000 Tesla Roadster. Image from Flickr. One year after a $50 million partnership between Daimler and Tesla was announced, Toyota and Tesla announced their $50 million partnership. Tesla motors has been promising a mass-market, mass-produced, electric Model S by 2012. This Toyota and Tesla partnership, in addition to an initial public offering, should raise enough cash for Tesla to make good on that promise. The partnership between Toyota and Tesla is about more than just a cash infusion for Tesla Motors. Instead, Toyota motors will provide Tesla access to the recently-closed NUMMI plant in Southern California. Toyota will also be providing expertise on engineering and building a car intended for the mass-market. Tesla will be providing Toyota with its proven electric drive train. When Toyota motors started, it was known as one of the most flexible and innovative carmakers in the world. That image, with the failure of the NUMMI plant and hundreds of recalls, has run into problems lately. Akio Toyoda, while announcing the partnership with Tesla, also said that he hopes Tesla helps teach Toyota about “quick decision-making and flexibility” — thingw Toyota used to be known for. About one year ago, German automaker Daimler invested about $50 million in Tesla motors. Daimler and Tesla worked together on creating a “Smart EV” program for Daimler, with Tesla providing battery expertise. There does not appear to be a particular conflict between Daimler and Toyota’s co-investments in the Silicon Valley Tesla Motors. Despite the $100 million in investments from Daimler and Toyota, Tesla motors will need several hundred million dollars more in order to get the Model S on the road by 2012. The Department of Energy has given Tesla a $465 million loan, and the initial public offering of stock is expected to raise an additional $100 million. With these investments, it is the hope of electric-vehicle fans the world over that the Tesla Model S will make it to the road, and be affordable, by 2012.